“Chesa Crusch Alva” – the neighbouring house of the Hotel Weisses Kreuz. Holiday home in one of the most beautiful village squares of the Alps! Magnificent mountain view! Our five holiday apartments are ideal for vacation the whole year through. They are oriented towards south-east and modern and brightly equipped. All have a balcony or garden seating area with panoramic views of our mighty local mountain Piz Ela (3339 meters above sea level). The upper floors can be easily reached by the lift. A washing machine and a dryer–tumbler are available in the house. There are free parking places behind the house and a basement for skiers and bikes. Usually you take care of yourself. On request, however, we serve breakfast at the Hotel Weisses Kreuz. Half board is also possible. The hotel reception is also open 7 days for our guests. In winter you live in the middle of the world-famous tobogganing Mecca on the Albula Pass and in spring, summer and autumn you stay in a paradise for hikers, bikers, nature lovers and railway fans. 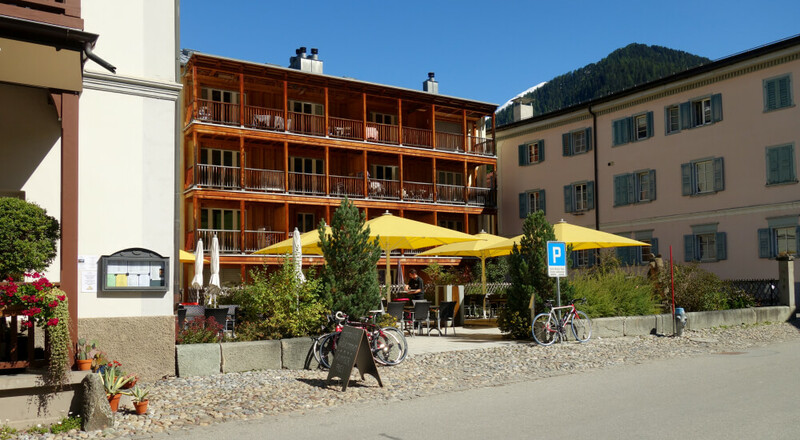 The apartments are only a 5-minute walk from the Rhaetian Railway (RhB) station. St. Moritz and Davos can be reached in less than an hour with this narrow-gauge railway.